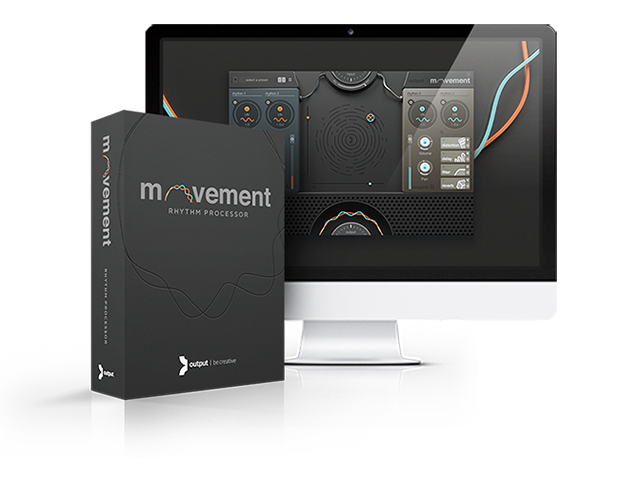 Output, the creative force behind the development of innovative software instruments such as REV, SIGNAL, and EXHALE have taken the music community by storm once again with the release of MOVEMENT, the company’s first effects engine built to transform any instrument, synth, raw sound or full track with the power of rhythms. Built equally for studio use and live performance, MOVEMENT is an effects processor designed to add rhythmic, textural motion to any audio source. This extremely innovative tool is designed to be a simple and intuitive sound manipulator that produces powerful results easily from a user-friendly interface. Simply dial in creative rhythms from an extensive library of 300+ presets or build custom sound-shaping rhythms from scratch using features such as Flux, Sidechain, LFO or Step Sequencer rhythm modulation. MOVEMENT’s impressive engine is also capable of controlling up to 38 parameters at once from four independent sources which can be processed by dialing in two identical effects engines. Sounds can then be tweaked further using a big XY pad to control up to 152 parameters in real time for ultimate hands on fun, perfect for performing live with or automated in a DAW to create a perfect blend of the original input and dynamic rhythms. 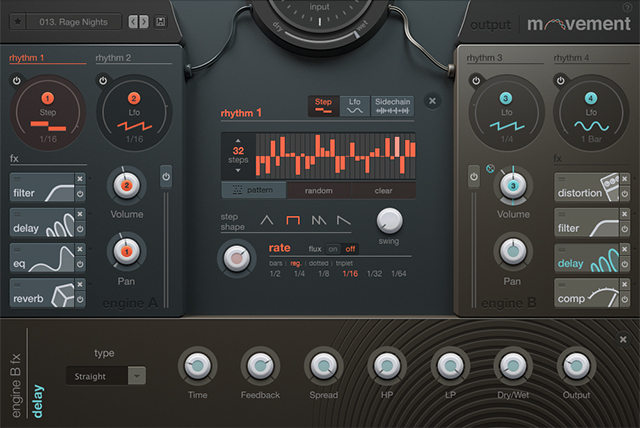 MOVEMENT’s power is propelled by two separate rhythm/FX engines that feature four FX slots, two rhythm sources for modulation, volume and pan controls, a mute button, and a dedicated VU meter. To assign a rhythm, simply click, drag and drop the rhythm’s circular number icon over the desired parameter knob. Then set the desired amount of rhythmic modulation by dragging the rhythm slider beneath the given knob. 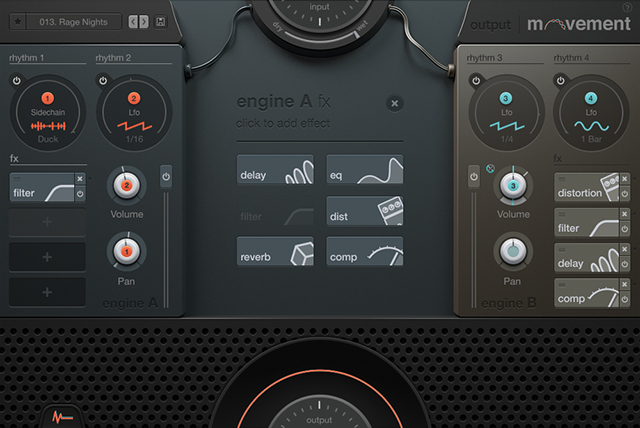 Each of MOVEMENT’s engines contains four FX slots designed to apply audio effects quickly from a selection of six types: Delay, EQ, Filter, Distortion, Reverb, and Compression. 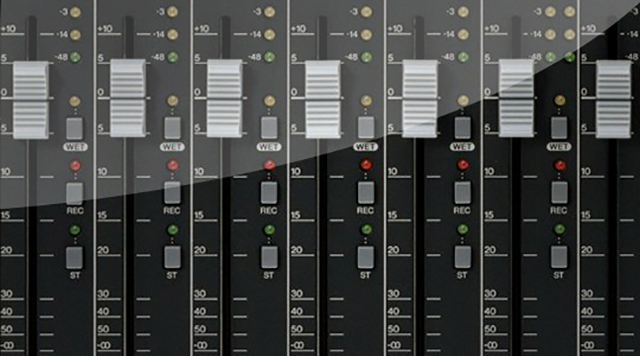 Clicking on any loaded FX slot will reveal additional controls to dial in the selected audio effect. Each engine also has two dedicated rhythm generators capable of modulating any audio effect parameter loaded in one of the four FX slots as well as engine volume and pan controls. To assign a rhythm to a parameter, simply click on the round numbered icon and drag it to any knob that will fit the circle. The colored rhythm amount slider beneath the knob sets the overall amount of rhythmic modulation happening on the selected parameter. MOVEMENT creates rhythms in three ways by loading either an LFO, Step Sequencer, or an external Sidechain input signal that can be converted into an envelope follower. 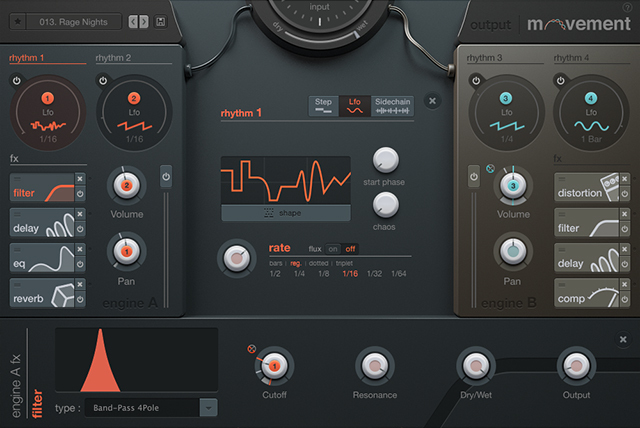 MOVEMENT’s rhythm LFO generator features twelve LFO wave shapes for maximum modulation possibilities. To select an LFO shape, open the LFO wave shape menu by clicking on the ‘Shape’ button and then choose a desired shape. The LFO can be tweaked further by adjusting the LFO shape, rate, chaos, and flux controls. 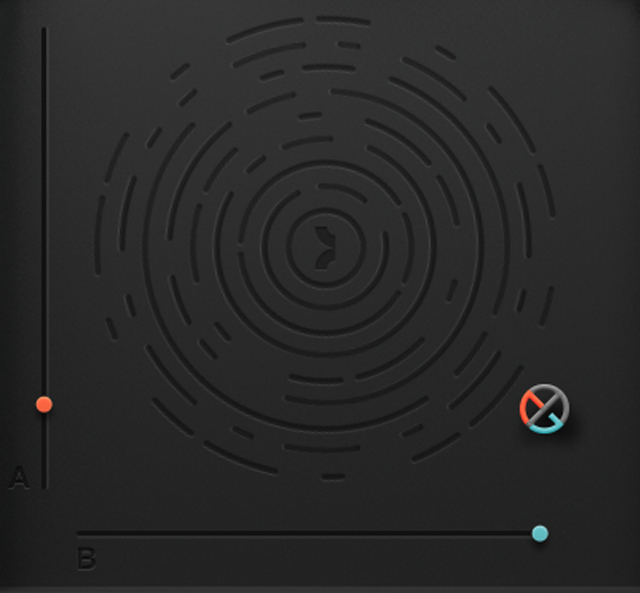 MOVEMENT’s step sequencer features 32 steps and four different step shapes each with different envelope characteristics. Quickly discover sequence patterns by opening the sequence pattern menu to choose from 36 different preset sequences or click the ‘Random’ button to have MOVEMENT generate a random sequence. You can also clear a sequence by clicking the ‘Clear’ button and adjust the ‘Swing’ knob for a more human groove. 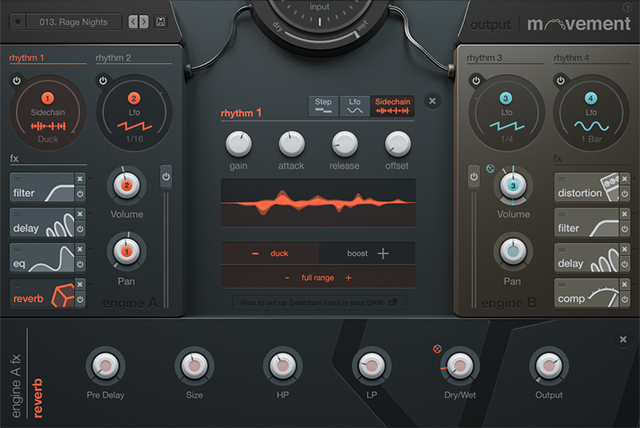 MOVEMENT can also create rhythms with the Sidechain feature by creating a modulation curve that follows an external signal coming from your DAW. MOVEMENT listens to the sidechain audio input and creates a corresponding attack/release envelope curve that becomes a modulation source. The sidechain modulation signal can either ‘boost’ or ‘duck’ a given parameter to generate that famous pumping effect. Dial in the sidechain modulation effect further with the Gain, Attack, Release, and Offset controls. MOVEMENT’s XY Pad is a powerful macro controller and performance tool that can be used to quickly and creatively dial in and modify your sound on-the-fly. This handy feature allows you to assign multiple effects parameters from both engines to macros and then simultaneously manipulate those effects with the XY Pad control for even more sound mangling fun.